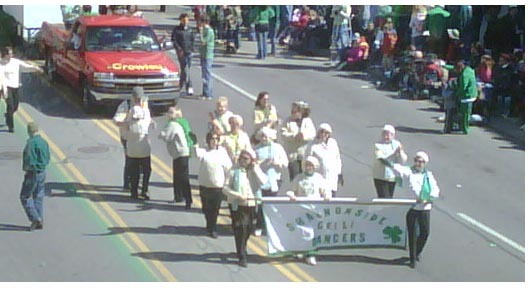 SHANNONSIDE CEILI DANCERS ARE AVAILABLE FOR PERFORMANCES! We have a 30-45 minute program with Irish music and Irish dancing. We can even include audience participation! Contact us to schedule an appearance, or for more information! We are an adult Ceili dance group in Rochester, NY. We rehearse on Monday evenings from September to May, and perform for nursing homes, charity organizations, and local events including the Rochester Irish Festival. The Shannonside Ceili Dancers were originally formed by mothers of girls taking Irish step dancing lessons. Rather than sit in the hallway and wait for the classes to end, they decided to take up dancing themselves. 30 years later several of the original members are still dancing. Today we're not just dance moms! We welcome men and women, new and experienced dancers, those of Irish birth/descent and those who just love the music and culture. Don't know the steps? Come join and we'll teach you! Contact us to find out more, join the group or request a performance! Our regular dance practice is Monday evenings at 7:00 PM. Right now we're in the middle of performance season, so check our Calendar for practice nights. Celtic Woman comes to Rochester on March 26, 2019! Check the NEWS page for details! Rush-Henrietta Spectrum Singers, a 24-voice auditioned ensemble, sings "Danny Boy". Remember to check the News page for updates on performances, friends & family and Irish events! Check the "Links" page for good stuff! And the piper's name was -- Spring!